Berkeley's Soda Tax Appears To Cut Consumption Of Sugary Drinks : The Salt According to a new study, the nation's first soda tax succeeded in cutting consumption of sugar-sweetened beverages. But there's uncertainty about whether the effect will be permanent. 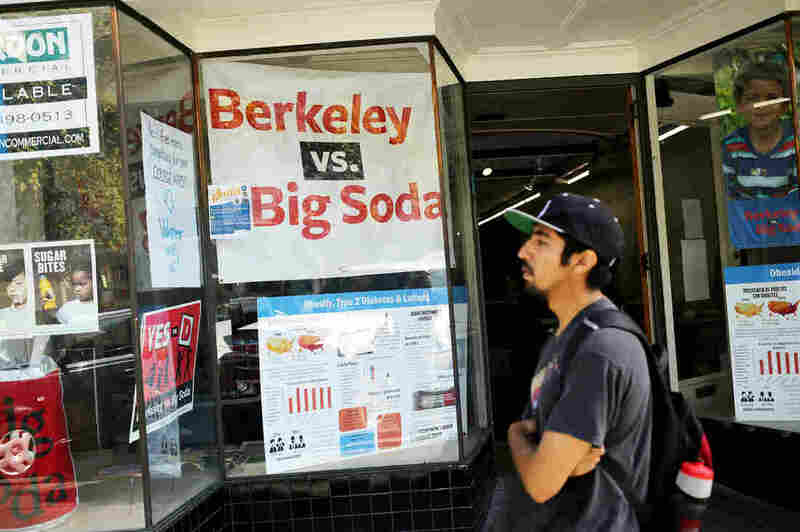 Berkeley, Calif., passed the nation's first soda tax in 2014. According to a new study, the tax has succeeded in cutting consumption of sugar-sweetened beverages. But there's uncertainty about whether the effect will be permanent. The nation's first "soda tax" on sugar-sweetened beverages, which went into effect in Berkeley, Calif., last year, appears to be working. According to a new study, consumption of sugary drinks — at least in some neighborhoods — is down by a whopping 20 percent. That estimate results from what Kristine Madsen, a researcher at the University of California, Berkeley's School of Public Health, calls a "perfect natural experiment." In the fall of 2014, voters in Berkeley and San Francisco, on opposite sides of the San Francisco Bay, voted on proposals to tax sugar-sweetened drinks at the rate of one cent per fluid ounce. The proposals were aimed at reducing consumption of these drinks, which are blamed for increasing rates of obesity and Type 2 diabetes. Before the votes, Madsen and a small army of collaborators began laying the groundwork for efforts to measure whether such a tax would actually work. They targeted low-income neighborhoods of each city, as well as Oakland, and carried out surveys of people they met on the street. "We asked how often they drank various beverages," Madsen says. They recorded the answer and waited for the vote. The tax did not pass in San Francisco. But it did in Berkeley. So sugary drinks became more expensive Berkeley, but not in San Francisco. Madsen and her collaborators then returned to the same neighborhoods, with the same questions. "I would say, 'How often do you drink regular soda, like a Coke, or Sprite? Once a week? Once a month?' And some people would just say, 'Well, I drink it every day.' And what we were trying to do was get some way of making everybody equal, so that everybody could be expressed as times per day that they drank soda." Before the vote, the answers had been very similar in both cities. The average person drank about 1.25 sugary beverages per day. After the vote, those responses diverged. In San Francisco, where there was no tax, people said that they were drinking slightly more sugary beverages. (It was a hot summer.) In Berkeley, though, reported consumption of sugar-sweetened drinks went down by 20 percent. People in Berkeley reported a huge increase in their water consumption. Water consumption increased in San Francisco as well, but not by as much. Madsen says a 20 percent reduction in consumption of sugar-sweetened beverages would be enough to reduce rates of obesity and Type 2 diabetes in years to come. "This would have a huge public health impact if it were sustained," she says. She is not sure it will be sustained. People may be more inclined to react to such a tax when it is new. John Cawley, a professor of public policy and economics at Cornell University, says that a 20 percent drop is more than economists would have predicted, since the tax caused prices of sugary drinks to go up only modestly. Cawley and others found that soda sellers did not pass the full cost of the tax on to consumers but absorbed somewhere between 30 and 50 percent of the cost themselves. "This is a big decrease" in consumption, Cawley says. "It makes complete sense that, when prices go up, people buy less. That's the law of demand. So I did expect to see some kind of decrease in consumption, but this is a very large decrease." Cawley noted that there is a relatively large margin of error in the estimates of beverage consumption. "It will be interesting, as more information comes in, whether this finding holds up." "This isn't the final answer," says Michael Long, a professor of public health at George Washington University, "but it is consistent with what we know about how people respond to prices. This definitely adds a lot of information about reductions in reported consumption, and we'll have to look further to see if we're seeing reductions in sales data." The American Beverage Association, which represents the soda industry, says that its member companies don't provide detailed data on sales trends within particular cities. Brad Williams, an economist with Capitol Matrix Consulting in Sacramento, Calif., who has been a consultant for the beverage industry, told The Salt that the successful pro-soda tax campaign in 2014, rather than the tax itself, may have led people to report that they were drinking less soda. "There's a limited price differential between sugar-sweetened and non-sugar-sweetened beverages, especially in chain stores," he says. "It's not like consumers are getting price signals, so to the extent that consumption was reduced, it was the result of the campaign" against sugary drinks rather than the tax, he says. The new study was published this week in the American Journal of Public Health.